Crafty Andy: What was left under the Christmas tree? What was left under the Christmas tree? Our friends Bob and Javier joined us for Dinner. 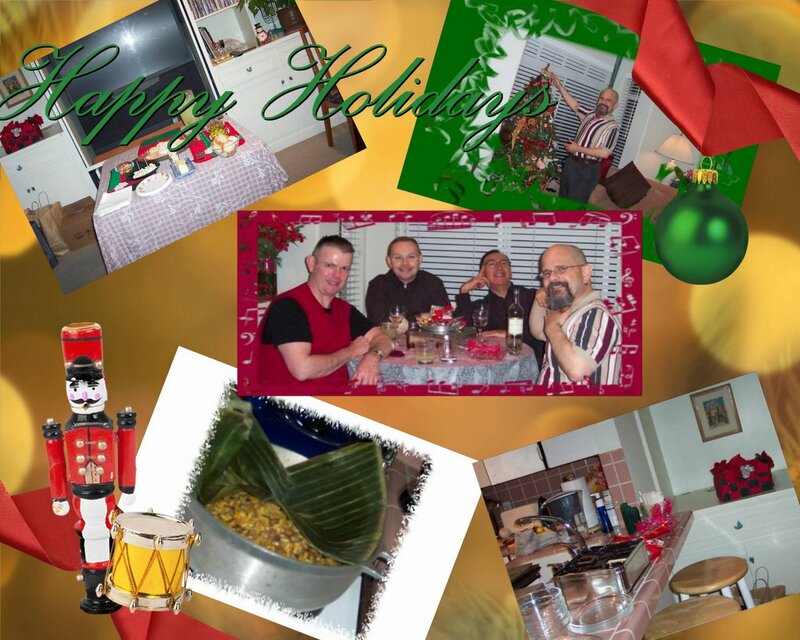 We had great tamales, arroz con gandules, which is a favorite in the puertorrican cuisine at this time of year. We had sweet rice pudding, a nice salad, coconut custard, home made non-alcoholic eggnog, some wine, chocolate cheesecake and cookies which I never had, I can eat the whole box. LOL There was home made bread, olives, brie cheese, blue roseborg cheese ( careful with that one They are BORG), salami, roasted nuts. A nice evening with some friends, and a very mild night in San Francisco weatherwise. I got very ethnic as you can see LOL. After the meal was over we saw Batman Begins. The guys left around 1130 PM, they needed to hurry if they wanted to catch Santa. Next day, or today there were presents under the tree. I got the perfect Gift Card , look by the by the Toy Soldier inside the box. You can never go wrong giving a Taurus money. A Taurus always thinks some for fun, some for savings and some for making more money and some for charioty, you have to share your abundance if you want to receive more. I hope your holidays were fun. I ate too much sugary stuff, I will have to go to the gym everyday to recover for it this next week. I got a lot of unexpected gifts and some that I already knew. Mike got a Madonna Cd, A vest and Knitted caps. Money and chocolate are always fun to get. May the rest of the year be full of wonder and fun. If you are wondering about the Virgin Icon and the crystal, the Virgin is called the Virgin of the Road, and the crystal is a citrine quartz which will bring you balance, it is a great stone for Aries and Libra specifically. So to the end of the year. This year was better than last and I am looking forward to nice changes in 2006. Thanks for stopping by and come back again. I'm glad you had such a good Christmas. You really deserved it! Heidi the Wonder Wiener turned out really well. I think that is a nice tribute to Scott (who did an amazing job designing the doggie). I think your stash is big enough to make a granny-square guest house! Looks like you will have a busy 2006! It looks like you had a fantastic holiday. What a cute :0 ,I almost said weiner, Heidi you have. 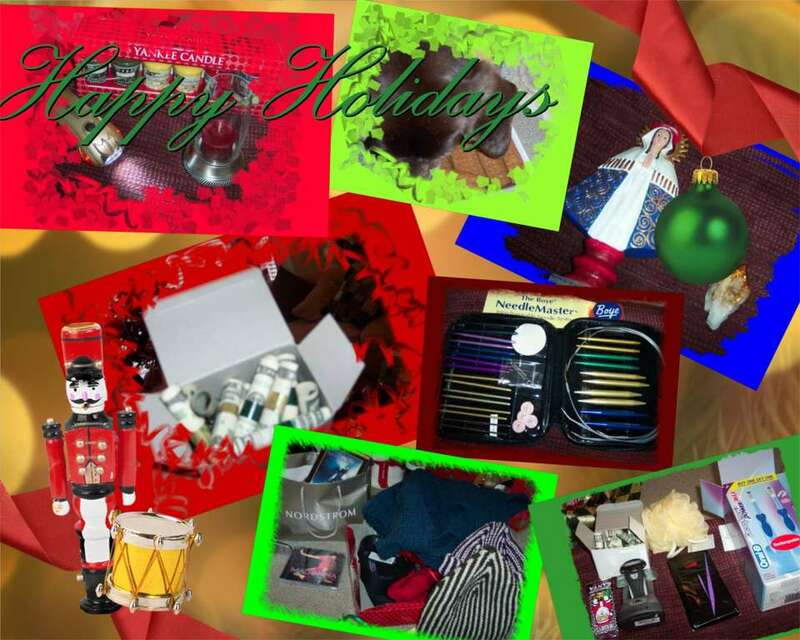 Sounds like you had a wonderful Chrismas :-) WOW! Boye Needlemaster. You have more purple needles than mine. I have my gandmothers Needlemaster which is ancient but nostalgic to me. Case is different but everything else looks the same. Hope you have a very nice, and safe, New Years! I'm with you Taurus boy! This Taurus girl likes her cold hard cashola!